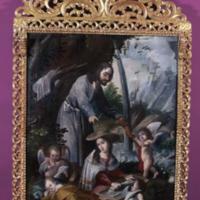 Images of a lovingly domestic Holy Family were popular in the colonial period, and circulated as paintings and prints in both Europe and the Americas. This large painting measures over 4 feet in height (50.25 x 39.5 inches, 127.5 x 100 cm) and adds unusual iconographical elements to a well-known narrative. In the center, Mary does the family laundry (with the assistance of Saint Joseph and angels), both underscoring her humility and creating a connection to female viewers who carried out similar tasks. Joseph is typically shown as older and contemplative (he is often reading in scenes with his family), but here he is young and active, gamely wringing out the clothes with an angel. Seated on the ground, Mary wears the broad-brimmed hat of a pilgrim or traveler, as she does in European prints, to identify this scene as taking place as the Holy Family fled to Egypt to escape Herod’s murderous wrath. In non-canonical books of the New Testament (the Apocrypha), Mary is described as washing Jesus’s clothes which, in turn, effect miracles. This theme, Mary-as-washerwoman, is unusual in the painting of Viceregal Perú. The abundant water in the scene also refers to the purifying waters of baptism. Melchor Pérez Holguín (ca. 1660-1732), who was born in Cochabamba, Bolivia, was the leading painter in Alto Perú and his commissions ranged from paintings of religious scenes (which he often imbued with a characteristic sweetness) to political spectacles. Among his primary patrons were wealthy individuals and convents in Potosí. 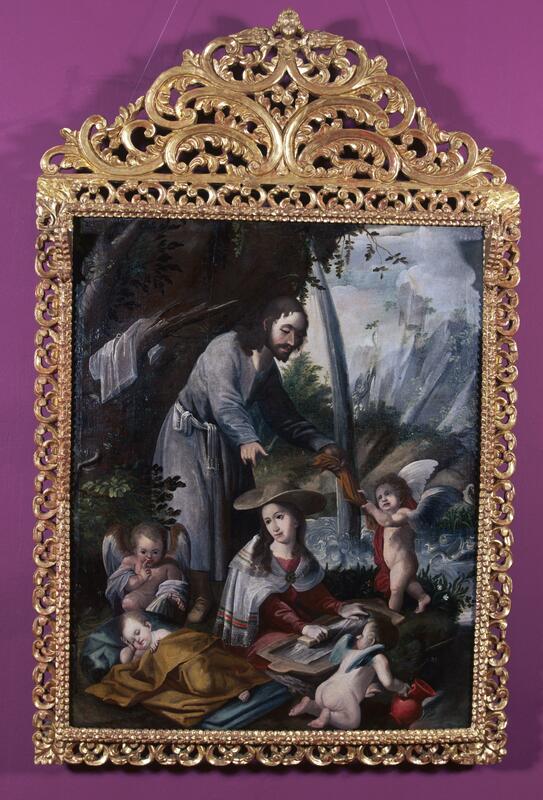 While many of Holguín’s works still hang in convents in Potosí and others are held by private collectors, this one belongs to a public collection—the Museo Nacional de Arte in La Paz, Bolivia. Mendieta Pacheco, Wilson. 1998. Melchor Pérez Holguín: brocha de oro. La Paz: Banco Central de Bolivia. Mesa, José de and Teresa Gisbert. 1977. Holguín y la pintura virreinal en Bolivia. La Paz: Librería Editorial Juventud. Querajazu, Pedro and Elizabeth Ferrer. 1997. Potosí: Colonial Treasures and the Bolivian City of Silver. New York and La Pas: Americas Society Art Gallery and Fundacíon BHN.